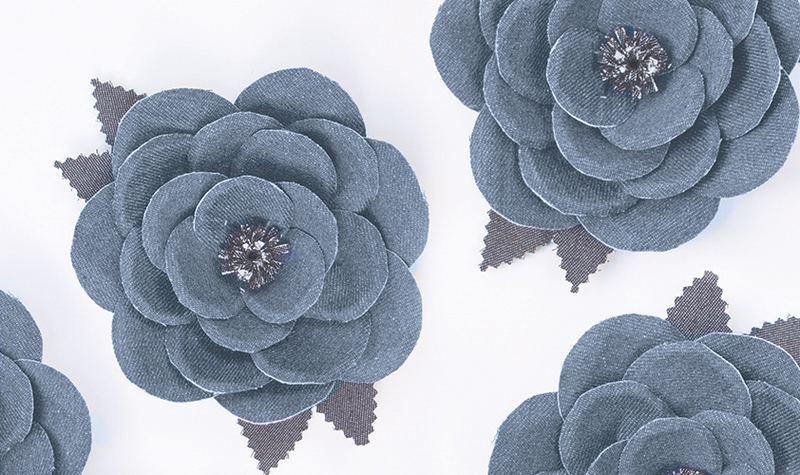 Create denim flowers to use in your home décor projects, scrapbooking embellishments, hair bows, and more! Cut out the flower template pieces. Using the pieces as a guide, determine how many are needed to create desired number of flowers. Trace needed number of flowers onto the back of the denim (paper side) and cut out. Beginning with the first flower set, glue the flower petals onto the round circle. Do not overlap the petals until there is one solid base layer. Continue adding petals, overlapping them until they move into the center and desired look is achieved. Set aside momentarily. Cut a 5/8” x 4-1/2” strip from another sheet of denim. “Fringe cut” the edges down 1/4” into the fabric. Once this is done, roll the strip together from one end to the other, fringe side up. Glue this in the center of the flower and “fluff” the flower as needed. Cut out the leaves in a wavy pattern or use “pinking shears” on the edges. Glueto the underside of the flower. You can use your fingers to curl the edges of the petals slightly to the back of petal. This will create a nice petal shape. If you want the flower petals to sit tighter against each other, then overlap more petals. If you want the flower petals to sit more loosely, only overlap a small amount. If the first fringed center doesn’t look big enough, add in another one using the same technique.